Gas stations around the country use all kinds of point-of-sales systems and can benefit from added control and convenience when their system links to gas price signs. Watchfire continues to add more POS options, and we are proud to announce that our Price Watcher gas price displays integrate with Gilbarco’s point-of-sale (POS) system. A Request For Proposal (RFP) is a bidding process that many companies and municipalities use to purchase big-ticket items. 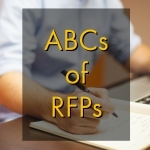 Once you’ve determined the RFP is a good lead, improve your chances of winning the bid with these ABCs of RFPs. Today’s technology provides a better and more adaptable solution for changeable displays. Watchfire’s high resolution LED displays, with resolutions of 4mm or smaller, look better, last longer, and give display operators a wider variety of content options. When planning an interior video display, consider the advancements that make Watchfire displays the next generation of video walls.